Overview: Pay attention people! There are a lot of moving parts in this book, and if you skip a page, you might be totally lost. We’ve got multiple Reed Richards and Johnny Storms and Things, but only one Sue Richards. And if you look closely, you will see some familiar faces in the Marvel Bullpen, with Stan, Jack, George, Roy and more. All of this and more in Essential Fantastic Four Vol. 8. The book starts out with a three-way war between different universes. 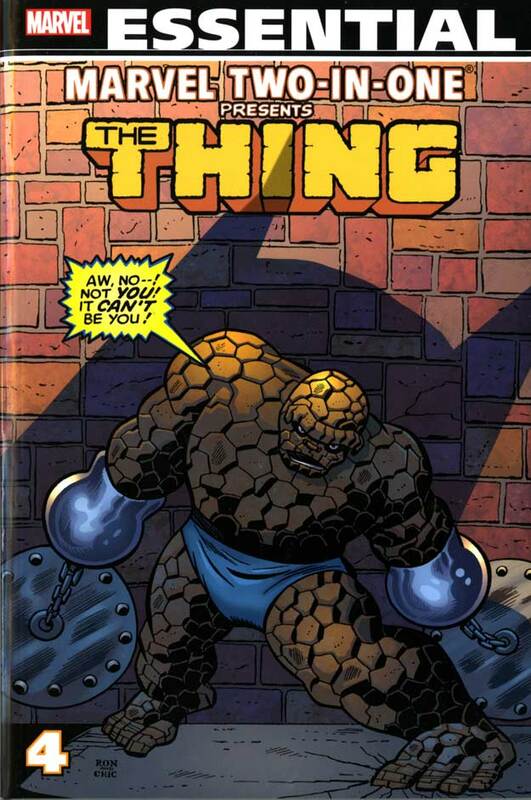 One of those universes features a Fantastic Four where Reed Richards gained the powers (and rocky outlook) of the Thing when they were exposed to the cosmic rays. There’s another Johnny flying around too in this battle, so keep an eye out for him. 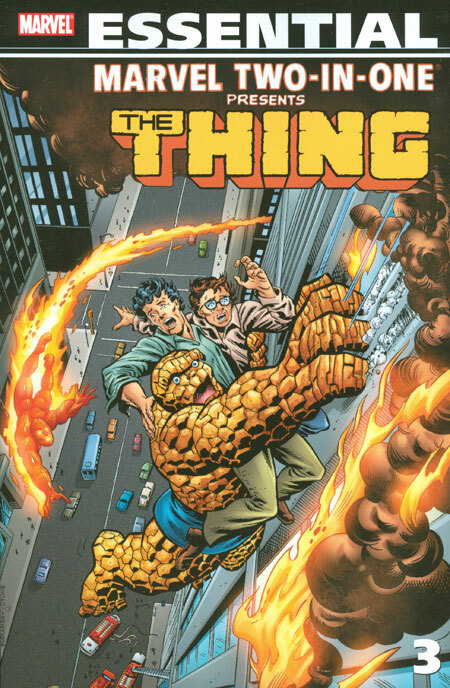 An eventful moment in the history of the team followed a unique team-up between the Thing and the Hulk. As the two were skipping around the midwest, the Hulk’s gamma-radiated body counter-acted the Thing’s cosmic-radiated body and turned him back into Ben Grimm. Faced with the requirement to maintain four powered members on the active roster, Reed recruits Luke Cage, the hero for hire, to serve as a member of the team. Luke’s stay with the team is short, thanks to the shenanigans of the Puppet Master, but it gave Reed enough time to finish an exoskeleton Thing suit for Ben to wear and regain his place in the team. However, we realize about this time that Ben is not the only one without a power loss, as Reed’s stretching ability is starting to weaken, causing him great pain when he uses his abilities. Next, a time-travel story that teams the Fantastic Four with the Invaders and the Liberty Legion during the days of World War II. The team no sooner returns to 1976 before they find themselves caught up in a showdown between the High Evolutionary and Galactus. The world devourer is seeking to consume the High Evolutionary’s Counter-Earth, and the FF is sent out to seek out a suitable replacement world to sustain Galactus. One is found, but it comes with a cost – the return of the Impossible Man. Upon their return to Earth and a wild romp through the Marvel Comics offices, the Fantastic Four must stop the latest recruitment drive for the Frightful Four being held at their own headquarters in the Baxter Building. Despite the aid of Tigra, Thundra, and the Impossible Man, the Frightful Four are able to best the team with their new recruit, the Brute, who is actually the Reed Richards from Counter-Earth. The Frightful Four are defeated, but the Counter-Earth Richards replaces his counterpart as leader of the Fantastic Four, banishing our Reed Richards to the Negative Zone. The team soon realizes that the Reed leading their team is not the Reed they know and love, and they go out in search of their missing friend, but not before they encounter Annihilus. What makes this Essential? : Once again, I wrestled with how I wanted to review this book. The end of this book is the exact era when I started reading Fantastic Four issues off of the newsstands. So I am trying to not allow my childhood nostalgia of the title cloud my objective review of this collection. I like this better than the previous Essential volume, so that is a plus. I think Roy Thomas finally started to understand the possibilities of what he could do with the characters and began working on the characters and concepts that most interested him. The art is superb, whether it comes from either of the Buscemas, Perez, or the underrated Rich Buckler. But….. I still don’t think these stories live up to the moniker of “The World’s Greatest Comic Magazine.” I would rather be reading the Lee-Kirby issues or skip ahead to the John Byrne run. 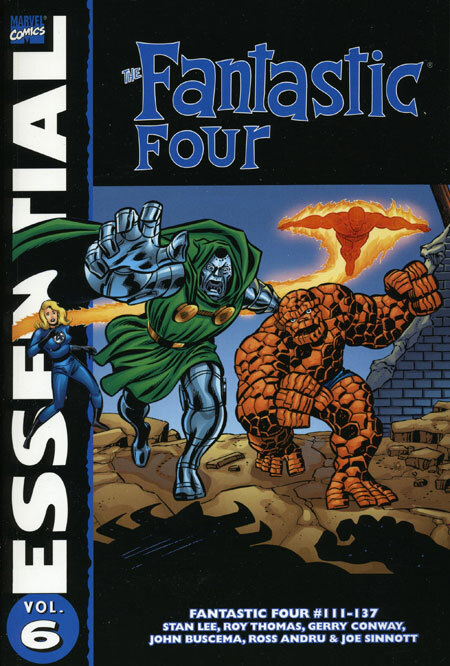 Footnotes: Fantastic Four Annual #11, Marvel Two-in-One Annual #1 and Marvel Two-in-One #20 are also reprinted in Essential Marvel Two-in-One Vol. 1. 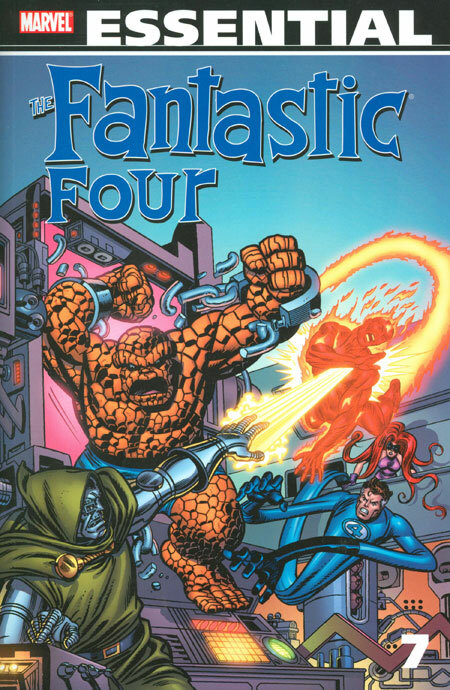 Fantastic Four #180 is a reprint issue of Fantastic Four #101, which was reprinted in Essential Fantastic Four Vol. 5. The new cover to Fantastic Four #180 is included in this Essential. If you like this volume, try: the 2011 Impossible Man trade paperback, collecting many of the green hero’s more memorable appearances. Created by Stan Lee and Jack Kirby back in Fantastic Four #11, the character was quickly forgotten about when the bad feedback came in from the readers. He sat dormant for nearly 15 years before writer Roy Thomas brought him back in Fantastic Four #176, making him a supporting character for the next few years in the FF title. In the 1980s, the Impossible Man started expanding into other parts of the Marvel Universe, crossing paths with the likes of Spider-Woman, the New Mutants, and the Silver Surfer. In many ways, you could consider the Impossible Man to be the Marvel equivalent to Bat-Mite or Mr. Mxyzptlk, as the annoying character that can do most anything to vex the star of the title. This trade paperback collects many of those fun appearances. Overview: We are moving into the mid-1970s with the Fantastic Four. Not that things are ever normal around the Baxter Building, but there seems to be a set formula for most of these comics. We have the famous foursome of Marvel, with Reed, Ben, Johnny, and Medusa. Wait, what, Medusa? Don’t you mean Sue? Yeah, this is the Fantastic Four of the mid-1970s. Sit back and enjoy the ride in Essential Fantastic Four Vol. 7. For starters, Sue is still caring for the youngest member of the family, Franklin Richards. There are times during this run where Sue goes multiple issues between appearances. Thankfully, Medusa of the Inhumans has stepped in to help the group live up to their team name. And speaking of the Inhumans, the Fantastic Four and the Avengers are invited to Attilan for the marriage ceremony between Quicksilver (former Avenger) and Crystal (former FF member and sister of Medusa). Sadly, there are very few Marvel weddings that go off without a hitch, and this momentous event is crashed by Ultron. The other issues feel like echoes of the past. John Buscema and Rich Buckler both seem to embrace the Kirby style for the book, in terms of layout and characters. The writers give us a healthy dose of familiar foes, such as the Hulk, Doctor Doom, and the Frightful Four. And Thundra still shows up trying to convince Ben Grimm that they would make beautiful children together. 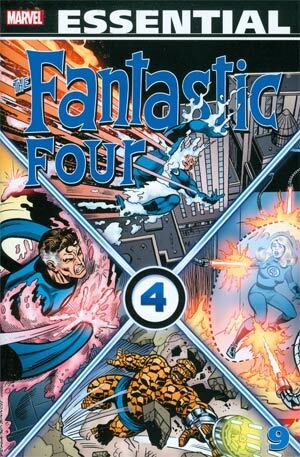 The highlight of the volume comes toward the end, with the final Giant-Size Fantastic Four, #4, in this collection. In a story co-written by Len Wein and Chris Claremont, Jamie Madrox (a.k.a. the Multiple Man) makes his debut. Madrox is a mutant who is able to create duplicates of himself when he is hit. The Fantastic Four was finally able to stop Madrox with the help of Professor Xavier from the X-Men. This FF comic came out right at the end of the reprint run in the X-Men book, and just three months ahead of Giant-Size X-Men #1 hitting the shelves. Wein would handle the re-introduction of the X-Men, before handing off the reins to Claremont, who would oversee the mutants for more than 15 years. What makes this Essential? : I don’t want this to read as a negative judgment on the Fantastic Four. I have been a big fan of Reed, Sue, Johnny, and Ben for many years. There are times when you have the right creators on the book (Stan Lee & Jack Kirby or John Byrne comes to mind) and this is the greatest comic in the world. There are a lot of other times when you have creators on the book whose goal appears just to get a comic out each month. That’s exactly what I feel when reading most of these issues. The writers seem to have troubles scripting Sue, relegating her to motherhood and off of the main team, replaced by Medusa in most issues. There are very few new characters created during this run, as listed above, relying instead on retreading the same familiar characters from the Lee-Kirby years. Even as a die-hard FF fan, I don’t know that I would suggest other fans to grab this collection. Footnotes: Avengers #127 and Fantastic Four #150 are also reprinted in Essential Avengers Vol. 6. Fantastic Four #154 is a reprint issue, with a new framing sequence. The story was originally published in Strange Tales #127, which was reprinted in Essential Human Torch Vol. 1. If you like this volume, try: the 2014 Fantastic Four series from James Robinson and Leonard Kirk. This series will be coming to an end in a few weeks, due more to senior editorial decisions than sales figures or story arcs. But there is still time to get caught up and finish the final story (for the foreseeable future) of Marvel’s first family. Robinson shakes things up, placing the team in red uniforms and breaking apart the group. 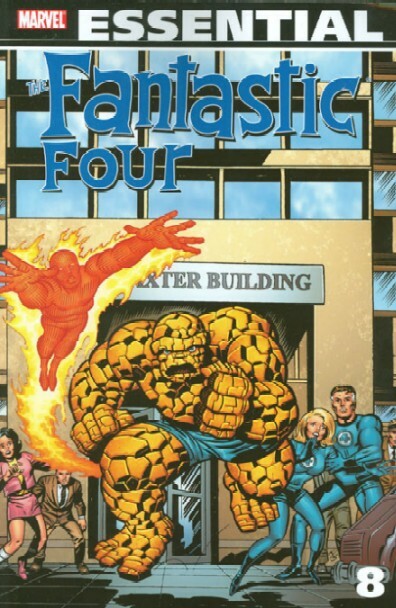 (On a side note, if you were to read some of the actual comics collected in this Essential, you would see Johnny Storm sporting a red version of the classic Fantastic Four uniform. So take that everyone that complained about Robinson messing with the uniforms.) With the team splintered, the individual members find themselves slowly brought back together, as they find that their recent setbacks, as well as other moments from their past, have all been influenced by one person. Robinson is a master storyteller, and this has turned out to be a great run. This is one I look forward to re-reading in one sitting when the final issue comes out later this spring. Overview: Welcome back to the World’s Greatest Comic Magazine, starring the Fantastic Four, although there appears to be five people running around in the blue union suits. 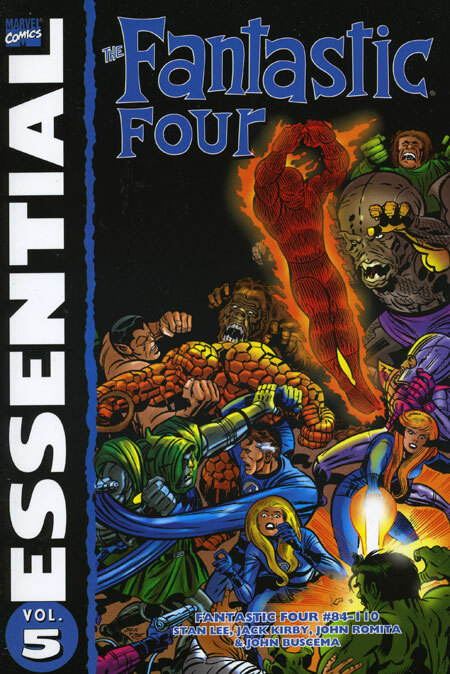 Let’s dive into Essential Fantastic Four Vol. 5! The stories in this volume start crossing over multiple issues, running three to five issues and immediately leading into the next storyline. This volume starts out with a Doctor Doom story, followed by the Mole Man and then Torgo. Other extended arcs bring back the Inhumans, and a Sub-Mariner/Magneto multi-part story. In between battles, we are introduced to Agatha Harkness, a witch who will serve as a nanny for young Franklin Richards. This will allow Mom and Dad to still be full-time members of the Fantastic Four. Agatha Harkness will become a fixture in the Marvel Universe for many years to come, watching over Franklin and helping to train the Scarlet Witch in the pages of The Avengers. The highlight of this book is Fantastic Four #100. The Mad Thinker and the Puppet Master launch another attack on the Fantastic Four, by controlling nearly every past Fantastic Four foe to attack the team as they are trying to travel home. Doctor Doom, the Sentry, the Wizard, the Hate Monger, the Sub-Mariner, and many others all try but fail. The Mad Thinker and the Puppet Master have one last secret weapon in reserve, an android version of the Hulk. Only the Hulk android cannot be controlled, just like its namesake, and destroys the lab. The Fantastic Four finally catch their breath (and a plane) to make their way home. Footnotes: Fantastic Four Annual #7 (November 1969) and #8 (December 1970) reprinted material from earlier issues of Fantastic Four. The covers for the two annuals are reprinted in this Essential. If you like this volume, try: Jack Kirby’s Fourth World storyline from DC Comics. In 1970, Kirby’s run was coming to an end, on both Fantastic Four and Thor, as well as with this run at Marvel. The next generation of writers and artists was coming into the Marvel bullpen, and the publishing company was turning into a corporation. Kirby had been offered a new but unfavorable contract by Marvel, and refused to sign. DC immediately offered a contract, and Kirby moved back to the Distinguished Competition. Right from the start, Kirby started up a story line that was dubbed The Fourth World. He took over duties on Superman’s Pal, Jimmy Olsen, and introduced three new books: The New Gods, The Forever People, and Mister Miracle. Mixing equal parts of super-hero tales with a pantheon of gods, Kirby’s Fourth World was an epic story before the concept of epic stories had been conceived. These stories have been reprinted numerous times, most recently as a Jack Kirby Omnibus collection.